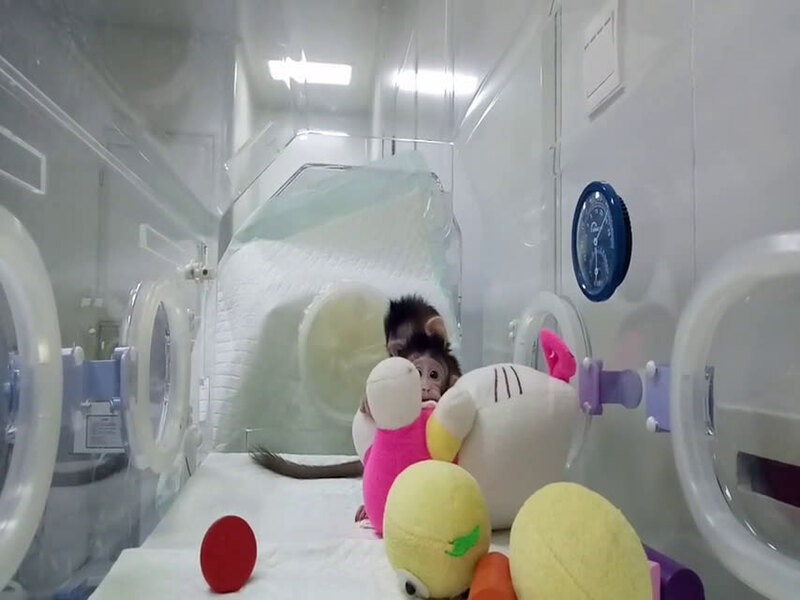 The first primate clones made by somatic cell nuclear transfer are two genetically identical long-tailed macaques born recently at the Chinese Academy of Sciences Institute of Neuroscience in Shanghai. Researchers named the newborns Zhong Zhong and Hua Hua—born eight and six weeks ago, respectively—after the Chinese adjective "Zhonghua," which means Chinese nation or people. The technical milestone, presented January 24 in the journal Cell, makes it a realistic possibility for labs to conduct research with customizable populations of genetically uniform monkeys. "There are a lot of questions about primate biology that can be studied by having this additional model," says senior author Qiang Sun, Director of the Nonhuman Primate Research Facility at the Chinese Academy of Sciences Institute of Neuroscience. "You can produce cloned monkeys with the same genetic background except the gene you manipulated. This will generate real models not just for genetically based brain diseases, but also cancer, immune, or metabolic disorders and allow us to test the efficacy of the drugs for these conditions before clinical use." Zhong Zhong and Hua Hua are not the first primate clones—the title goes to Tetra, a rhesus monkey born in 1999 through a simpler method called embryo splitting (Chan et al., Science 287, 317-319). This approach is how twins arise naturally but can only generate up to four offspring at a time. Zhong Zhong and Hua Hua are the product of somatic cell nuclear transfer (SCNT), the technique used to create Dolly the sheep over 20 years ago, in which researchers remove the nucleus from an egg cell and replace it with another nucleus from differentiated body cells. This reconstructed egg then develops into a clone of whatever donated the replacement nucleus. Differentiated monkey cell nuclei, compared to other mammals such as mice or cows, have proven resistant to SCNT. Sun and his colleagues overcame this challenge primarily by introducing epigenetic modulators after the nuclear transfer that switch on or off the genes that are inhibiting embryo development. The researchers found their success rate increased by transferring nuclei taken from fetal differentiated cells, such as fibroblasts, a cell type in the connective tissue. Zhong Zhong and Hua Hua are clones of the same macaque fetal fibroblasts. Adult donor cells were also used, but those clones only lived for a few hours after birth. "We tried several different methods, but only one worked," says Sun. "There was much failure before we found a way to successfully clone a monkey." The first author Zhen Liu, a postdoctoral fellow, spent three years practicing and optimizing the SCNT procedure. He tested various methods to quickly and precisely remove the nuclear materials from the egg cell and promote the fusion of the nucleus-donor cell and enucleated egg. With the additional help of epigenetic modulators that re-activate the suppressed genes in the differentiated nucleus, he was able to achieve much higher rates of normal embryo development and pregnancy in the surrogate female monkeys. "The SCNT procedure is rather delicate, so the faster you do it, the less damage to the egg you have, and Dr. Liu has a green thumb for doing this," says Muming Poo, a co-author on the study who directs the Institute of Neuroscience of CAS Center for Excellence in Brain Science and Intelligence Technology and helps to supervise the project. "It takes a lot of practice. Not everybody can do the enucleation and cell fusion process quickly and precisely, and it is likely that the optimization of transfer procedure greatly helped us to achieve this success." The lab is following strict international guidelines for animal research set by the US National Institutes of Health, but Sun and Poo encourage the scientific community to discuss what should or should not be acceptable practices when it comes to cloning of non-human primates. "We are very aware that future research using non-human primates anywhere in the world depends on scientists following very strict ethical standards," Poo says. Monkey Baby NEEDS Pacifier in its Mouth ! Awesome, this means it will work on humans too.